Love food and fast cars? Then one of the Bologna tours which you must definitely add to your bucket list is the Food and Ferrari Tour organised by Amazing Italy Tours. 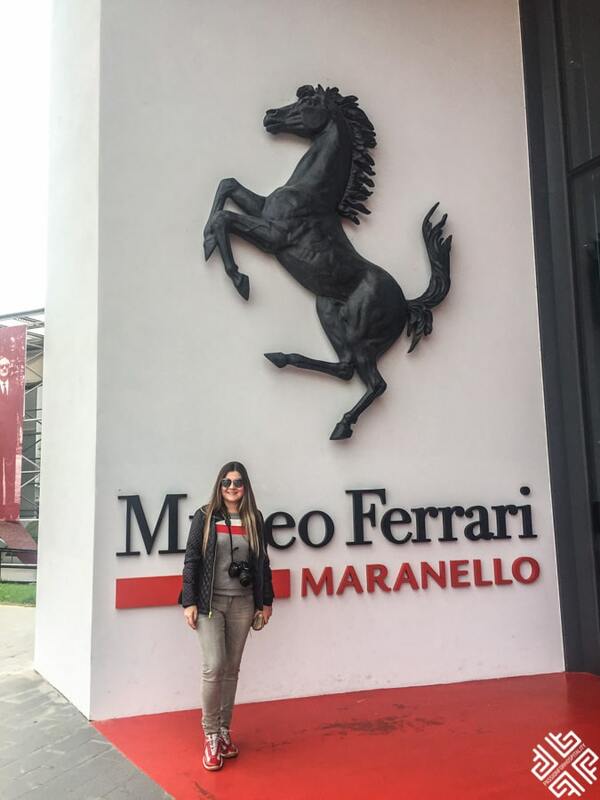 Not only will you visit the finest boutique producers of the Emilia -Romagna region, taste sensational Parmigiano-Reggiano, Prosciutto di Modena and the Black liquid gold — Balsamic vinegar but you will also get the opportunity to test drive a Ferrari. Curious to find out more? Then read all about my recent trip to Bologna. 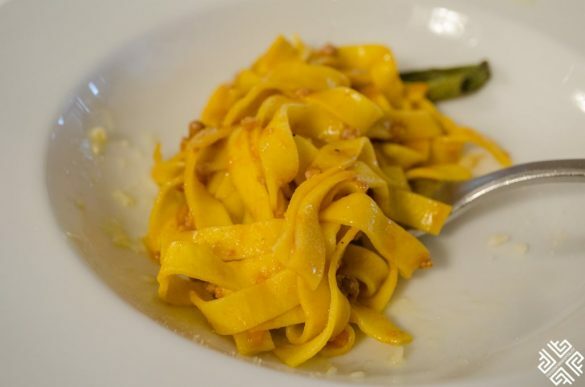 On a glorious Monday morning we joined Andrea and 6 other travellers on a Bologna day trip to explore the renowned food and motor valleys of Modena. 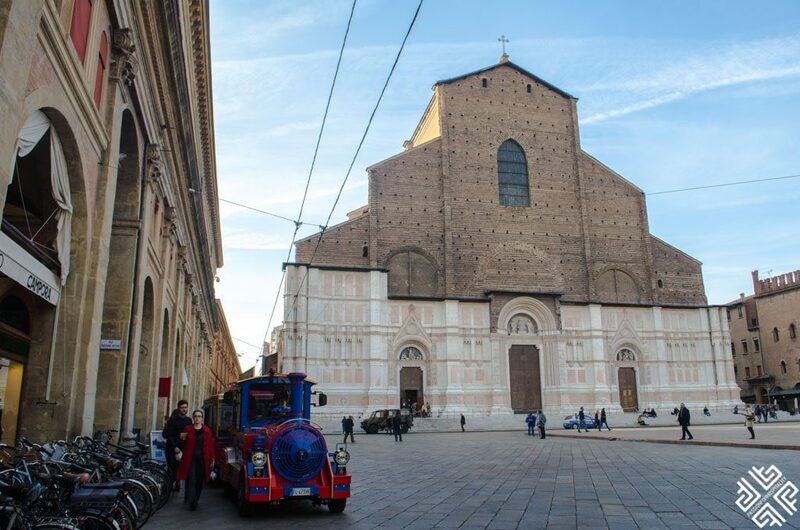 As we made ourselves comfortable in the luxury mini van equipped with a complimentary Wi-Fi connection and power sockets we were ready to depart from Bologna, the historic capital of Emilia-Romagna region. As Andrea explained the history of Bologna — a city which is 25 centuries old, we admired the beautiful colours of autumn and the gorgeous fields of cherry trees along the highway (if you are visiting Bologna during the summer months of June & July, you will actually have a brief stop to taste the cherries). 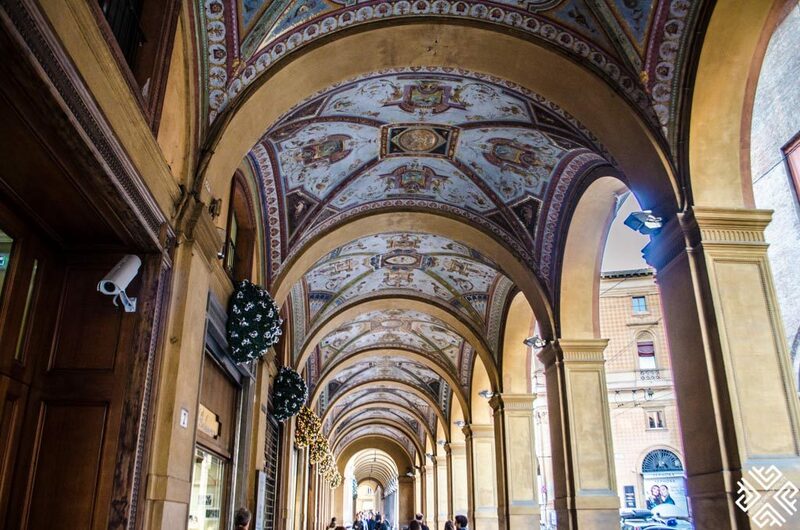 Bologna is characterized by its grand towers which had once reached a total of 180 (today only 24 remain), built by the wealthy families mainly for two reasons — firstly, to show off their wealth and secondly to protect the city from invaders. The city is also famous for the spectacular porticoes which cover a total of 43 kilometres. The crown jewel is the Sanctuary of San Luca, an important pilgrimage destination which is connected by a 3,5 km arcade with 666 arches —making it the longest in the world. 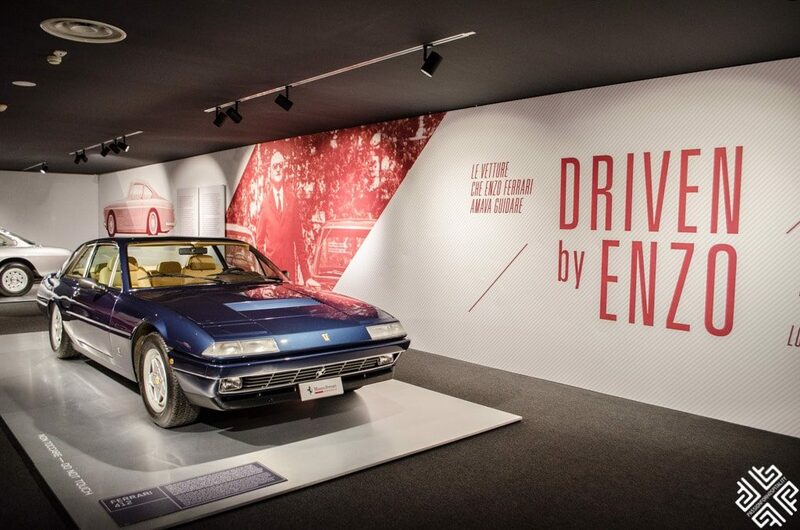 One of the most fertile regions of Italy, the Emilia-Romagna region is famous for its food and the Motor Valley where the world’s best luxury car makers were established. Here you will find the headquarters of 5 luxury cars such as Ferrari, Lamborghini, Pagani, Maserati and Ducati. 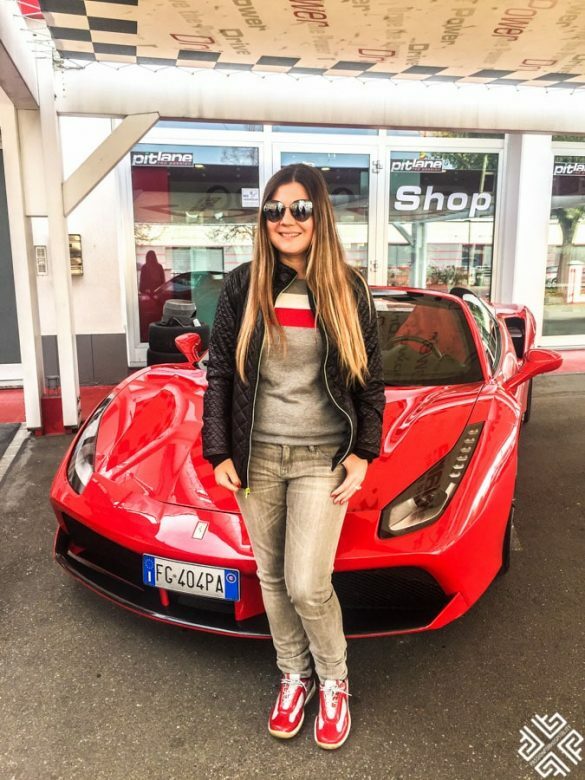 If fast cars is your thing then you might also enjoy the land of motors: Ferrari-Pagani-Lamborghini tour which runs every Friday. 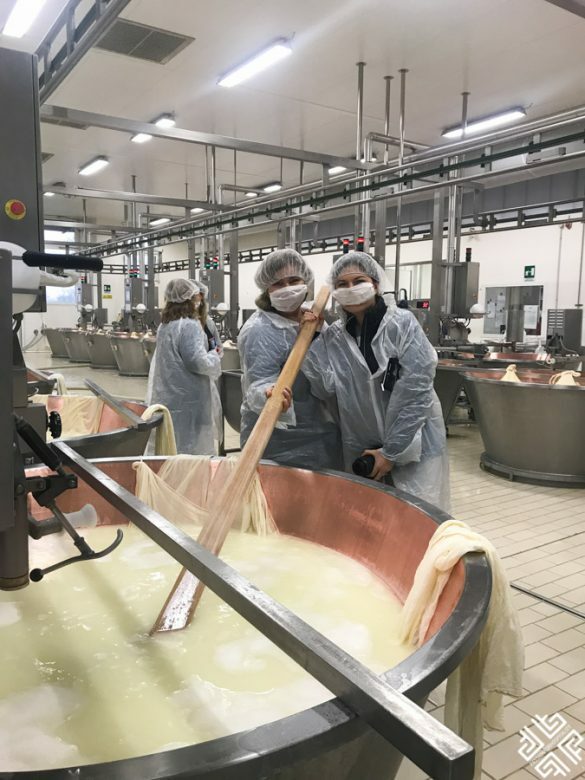 “Get ready to put on your Dolce & Gabbana outfit” said Andrea as we pulled over in front of a state-of-the-art Parmigiano-Reggiano dairy. 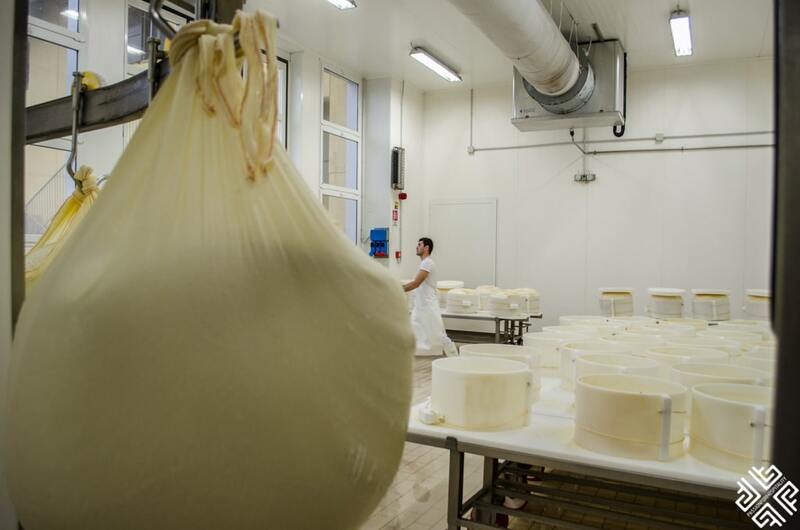 This boutique cheese maker has gained the title of the king of Parmigiano-Reggiano. 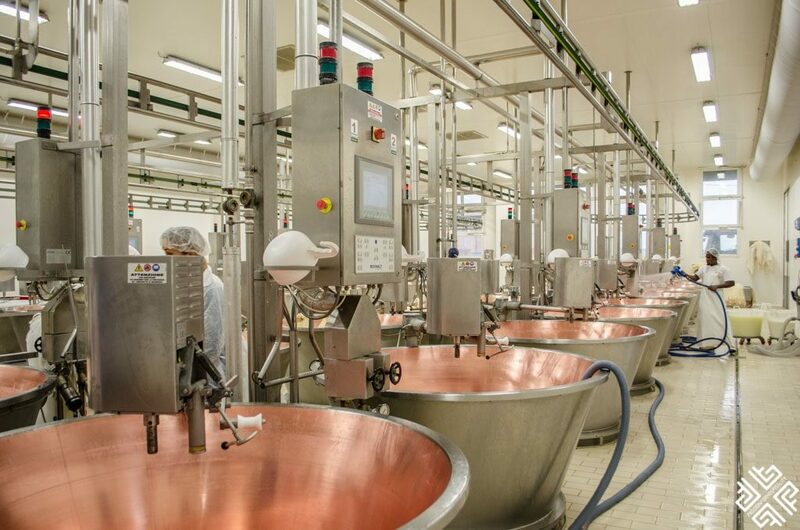 The dairy has undergone a 7 million euros renovation and is equipped with the latest technology. After putting on the plastic protective wear we were guided inside the first part of the production making. 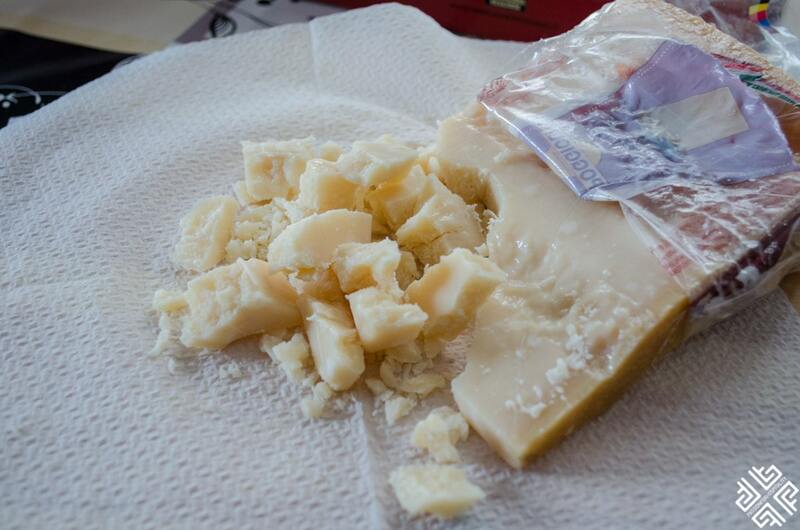 There are 400 producers of Parmigiano cheese in the region and 3500 milk producers. Two hundred seventy-five thousand cows are milked twice a day at 4 am and 4 pm. Each cow produces 32 litres of milk daily. 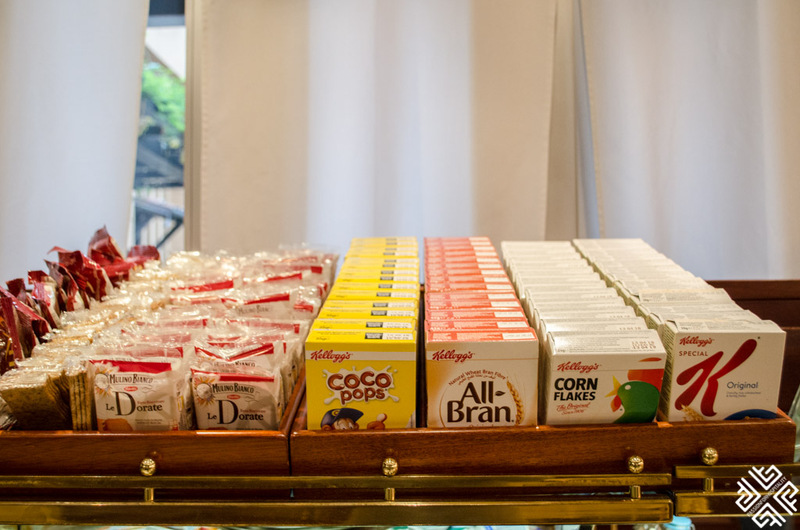 It is absolutely mandatory that the milk reaches the factory not later than in two hours. The afternoon milk is left to rest until the morning, the fatty part is used for making butter and the rest is then mixed with the morning milk for the production of the Parmigiano-Reggiano cheese. 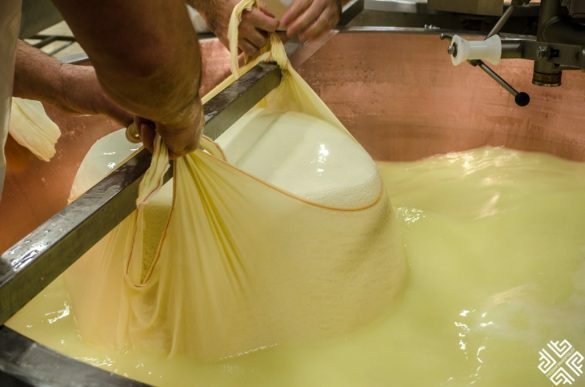 Approximately 12,000 litres of milk produce 100 kilos of cheese. The milk is cooked at 55 degrees celsius and the excess liquid is used for several purposes: to feed pigs, re-cooked for the making of ricotta cheese and as a rheumatism treatment. 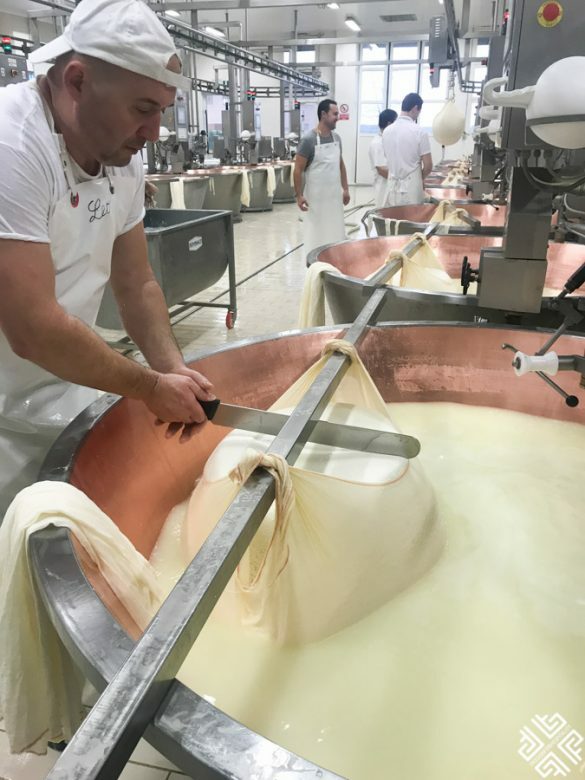 The first stage of the Parmigiano-Reggiano making involves processing of milk in the copper cauldrons after which the mass is covered with a piece of cloth, cut into two halves and tied onto a large metal rod which transports it into the second room with the aid of machinery. This of course is the new technology, otherwise all the process has to be done manually. The mass is then placed into a mould which gives it, its round shape. 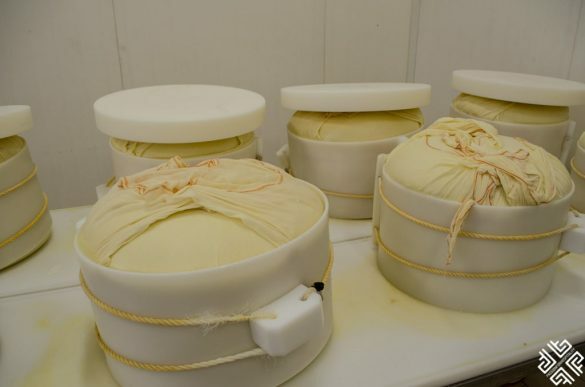 Each cheese wheel is then given its unique number using a special plastic case. Afterwards it is placed in a water and salt-saturated solution where it is left for a little less than a month. Following this process it is put into a special drying room for 24 hours. The cheese is then taken to a silent maturation room where it is stored on wooden shelves. 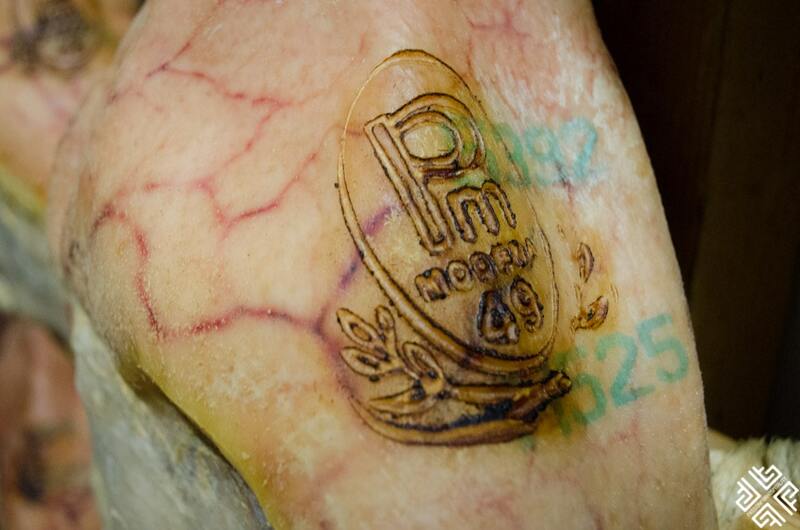 The minimum maturation period is 12 months at which point after it is being examined by a Consortium it is branded with a fire-mark that confirms that it has met the requirements of the Protected Designation of Origin. A system of coloured seals is used to differentiate the maturity period which is either 18 months, over 22 months and over 30 months. 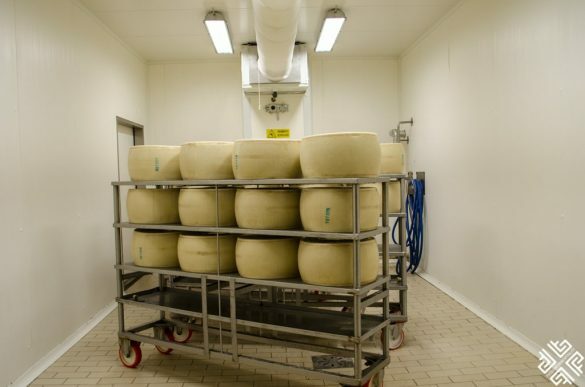 The maturation room that we visited is protected by the latest technology alarm systems as it stores over 20 million euros worth of Parmigiano-Reggiano wheels. During our visit we also saw an inspector examine the cheese with a use of a special hammer to identify whether any air has entered the cheese wheel, in case it did the cheese is sold as a second quality cheese. 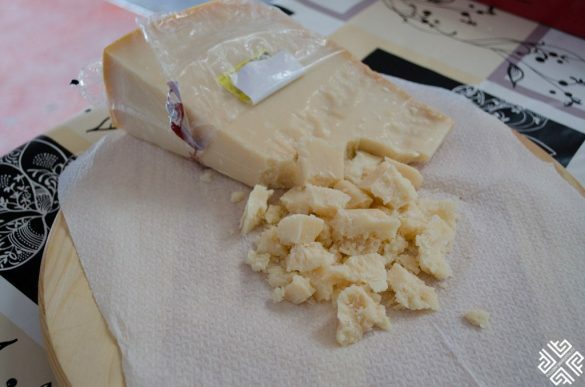 We then had the opportunity to taste two types of this remarkable product the 24 month and 36 month Parmigiano-Reggiano cheese paired with Pignoletto sparkling wine. 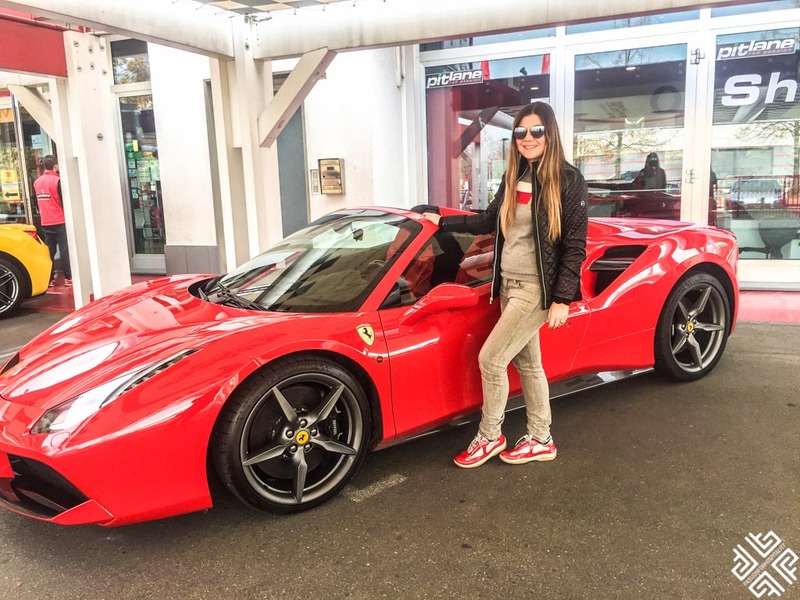 The Food and Ferrari tour is well paced as the producers are located at a close proximity from each other. 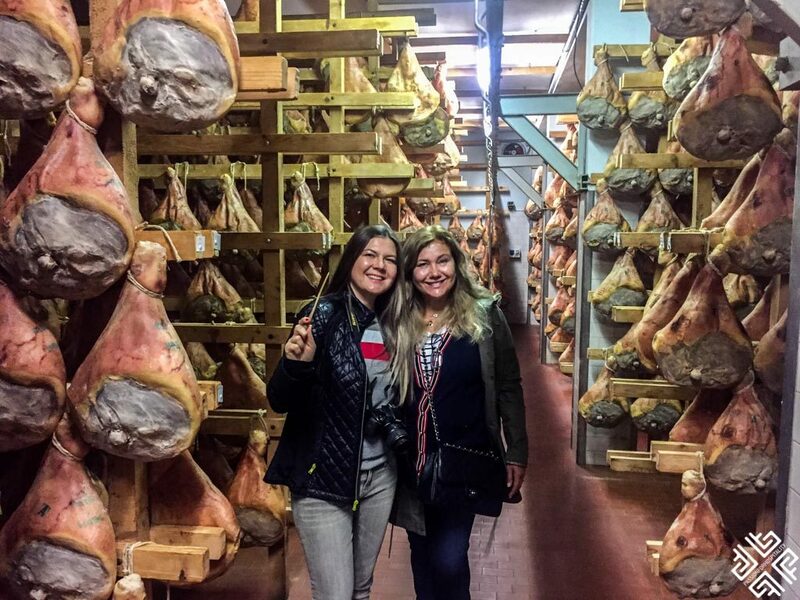 The second stop on our day trip from Bologna — took us to a third generation run Prosciutto di Modena maker which is managed by a bother and sister. Their grandfather had started the business in 1910 and has passed on the tradition of this fine ham making to his grandchildren. 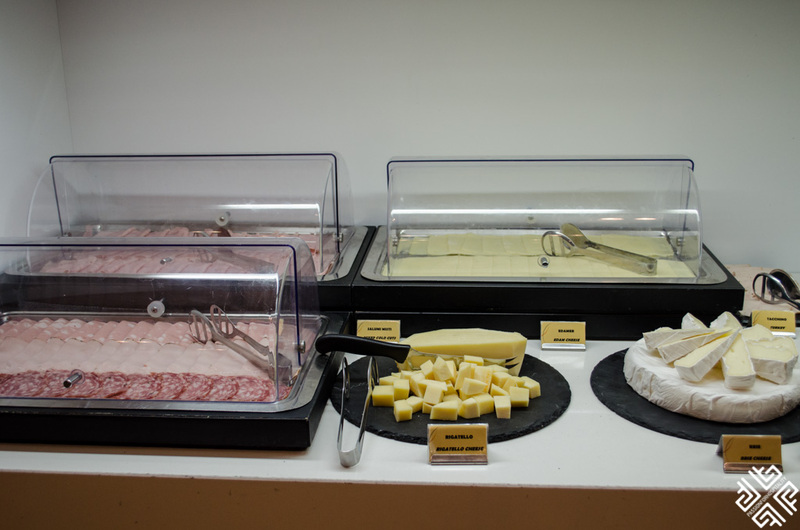 The world famous cold cuts from Emilia Romagna region have been recognized by the Protected Designation of Origin. This boutique Prosciutto di Modena maker produces somewhere between 350-500 prosciutto a week. 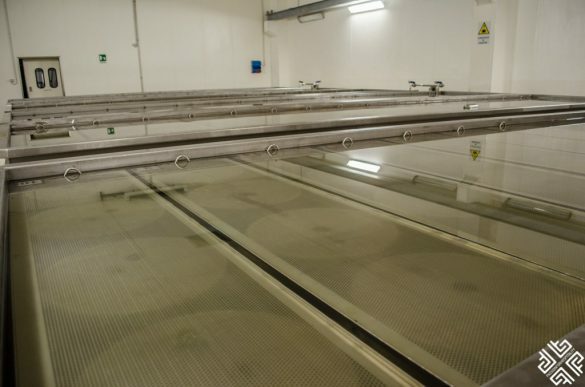 The initial production stage involves each leg being massaged with salt (twice), after which it is left to rest for 70 days in special temperature and humidity controlled rooms. The legs are then washed to remove excess salt, dried and covered with a special paste which is a mixture or rice, lard, flour and spices. For the next 14 months the seasoning process takes place to allow for the meat to absorb the right amount of salt and aromas. An authorised inspector from Parma examines the quality of the Prosciutto di Modena using a special horse bone needle. He checks 5 specific points that determine whether the product will receive the PDO mark. 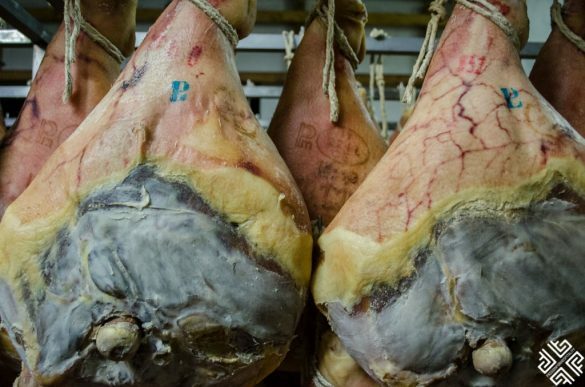 Following the tour of the premises we had a tasting of the Prosciutto di Modena served with a famous sparkling red wine from the region of Emilia-Romagna called Lambrusco. 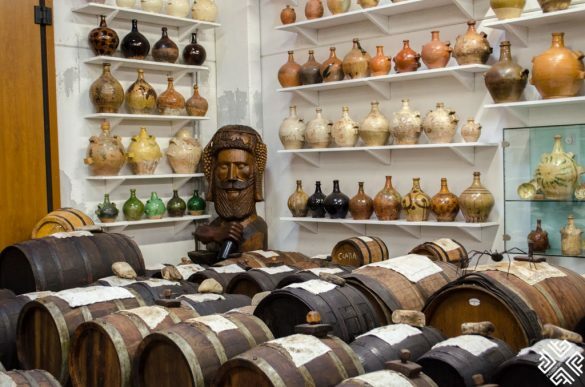 Also know as the black gold of the region, the original Balsamic vinegar is still only produced in the Emilia Romagna region and Modena. 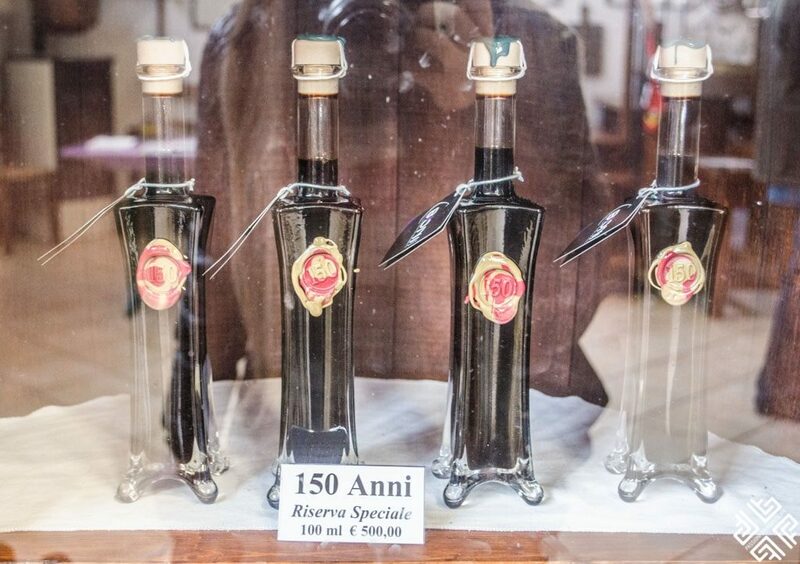 A small bottle can sell for as much as 500 euros and the process must be overseen by a specialised agency which grants the seal of approval or the DOP (Denominazione di Origine Protetta). 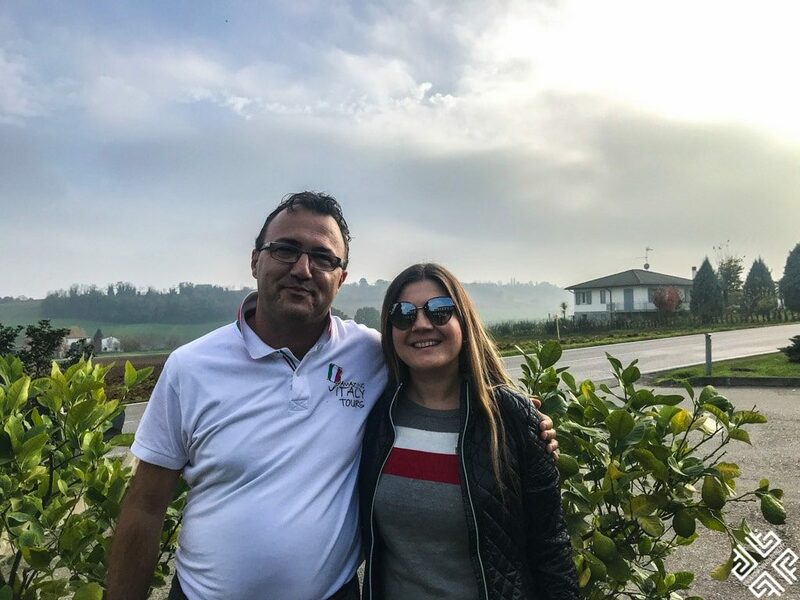 On the third stop of our Bologna day tour we visited the fourth generation run Balsamic Vinegar maker who has inherited the business from his grandfather who started the business in 1868. 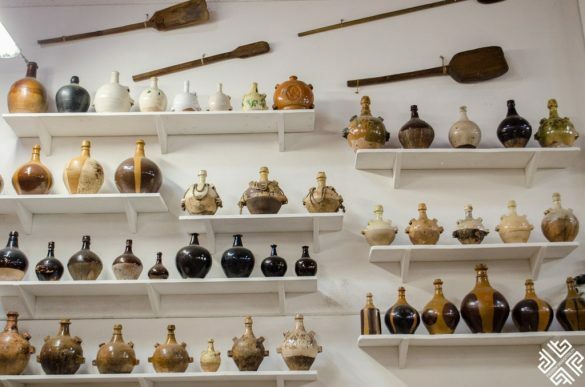 This thick black elixir was initially used as medicine and only became a condiment after the World War II. The grape juice is cooked to produce a dark coloured must which is then fermented and aged in a series of wooden barrels (different type of wood is used). The excess liquid evaporates over the course of the year (during the warmer months) and is then topped up with a fresh must. The same process is repeated year after year for at least 12 years. The secret recipe? — Time and passion! The slow building up of the deep, complex texture is also obtained from the movement of the balsamic vinegar from one barrel to another with a use of a special glass pipette. Some of the balsamic vinegars are aged using the same process for more than 100 years, passing on from one generation to the next. 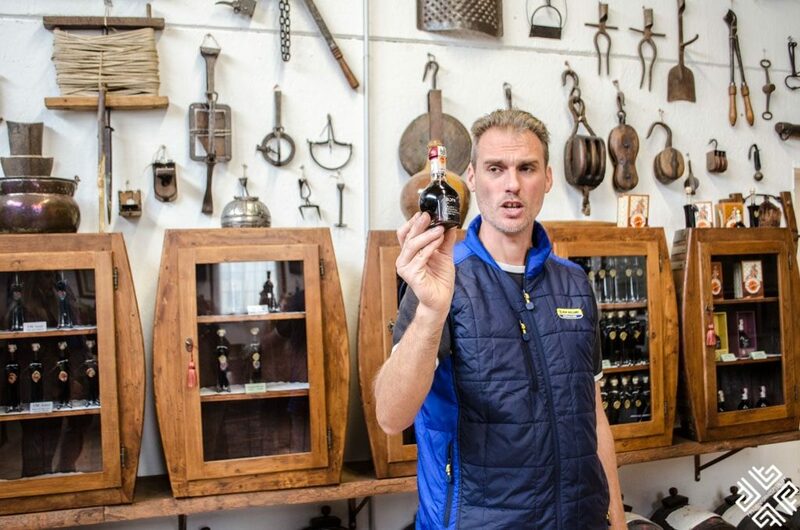 This traditional balsamic vinegar maker only produces about 1000 bottles per year which are only sold in his shop here in Modena. 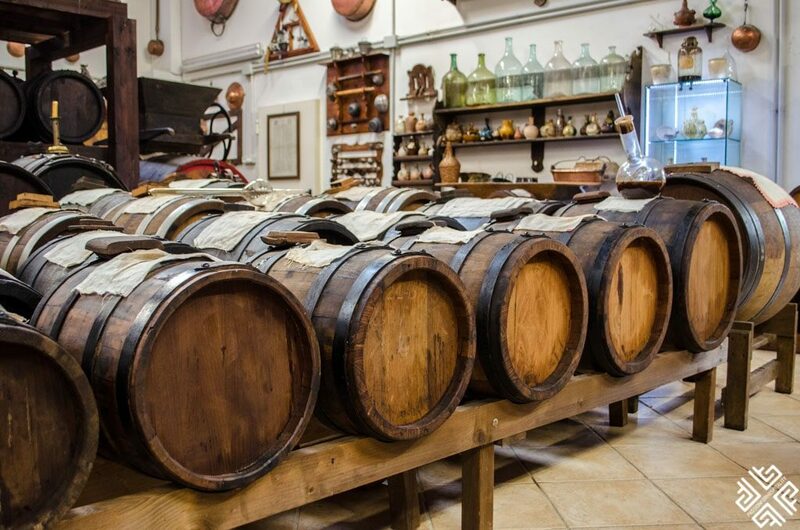 The Balsamic Vinegar of Modena is placed in special rounded bottles and must have an official label that guarantees their quality. After learning about the fascination process of balsamic vinegar we tried this thick syrup like condiment on parmigiano cheese and ice cream. 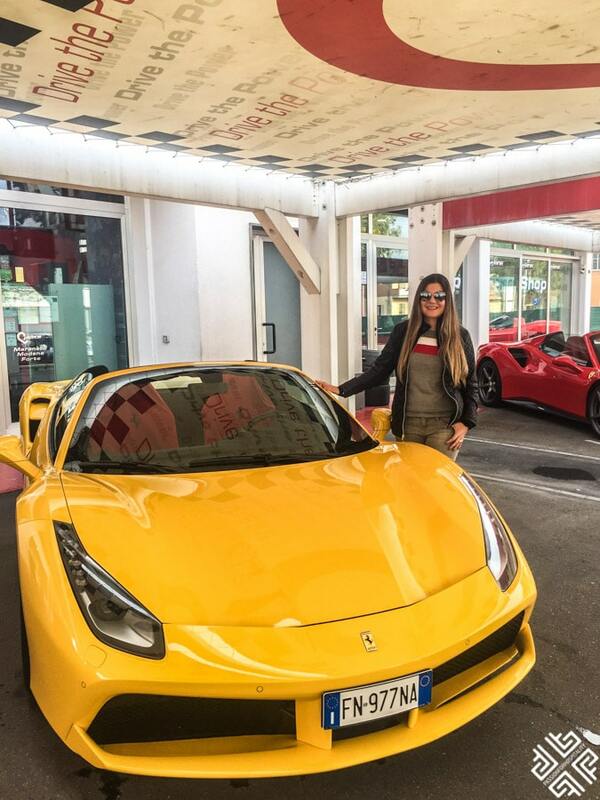 If you’ve ever dreamt of a Ferrari driving experience in Italy, all this and more can come true if you book this Bologna tour. 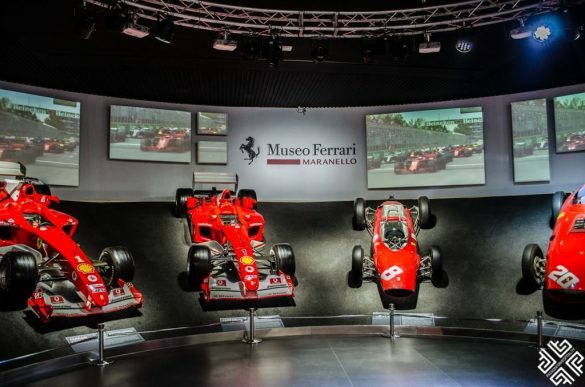 The official headquarters of Ferrari is located in Maranello where the Museo Enzo Ferrari Modena offers visitors the opportunity to discover the history of the company and to admire the cars from Enzo Ferrari’s personal collection. You will have around 45 minutes to explore the museum at your own pace and to take plenty of photos. 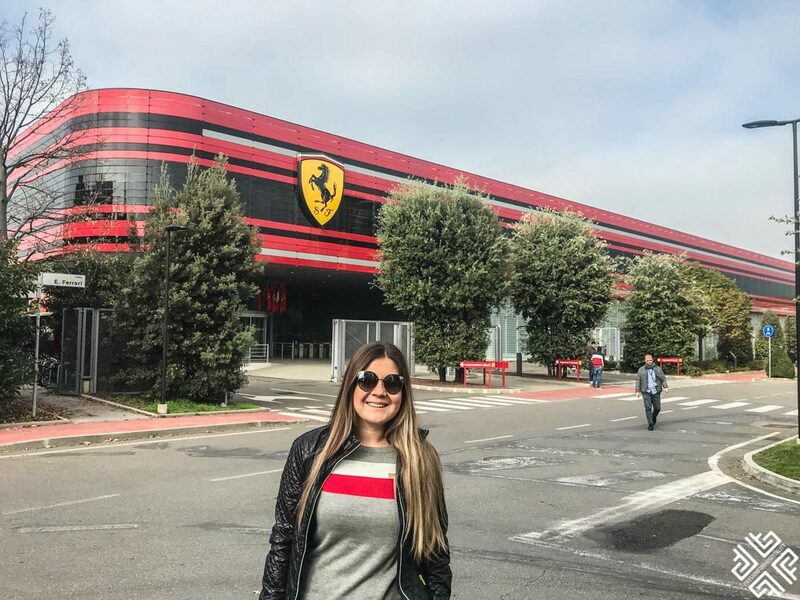 The test drive Maranello store which is located right next to the Museo Enzo Ferrari gives you the opportunity to drive a Ferrari at an extra cost. 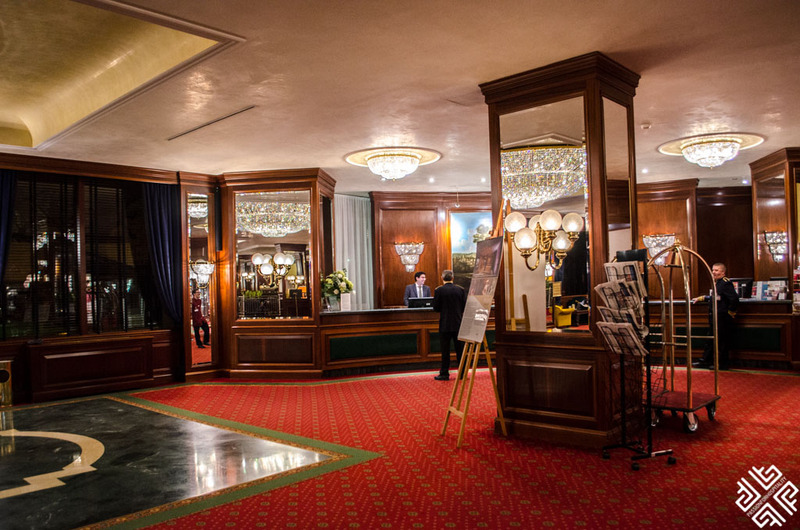 The rates start at approximately 120 Euro per person, where you will be escorted by one of the staff for a duration of 10 minutes. 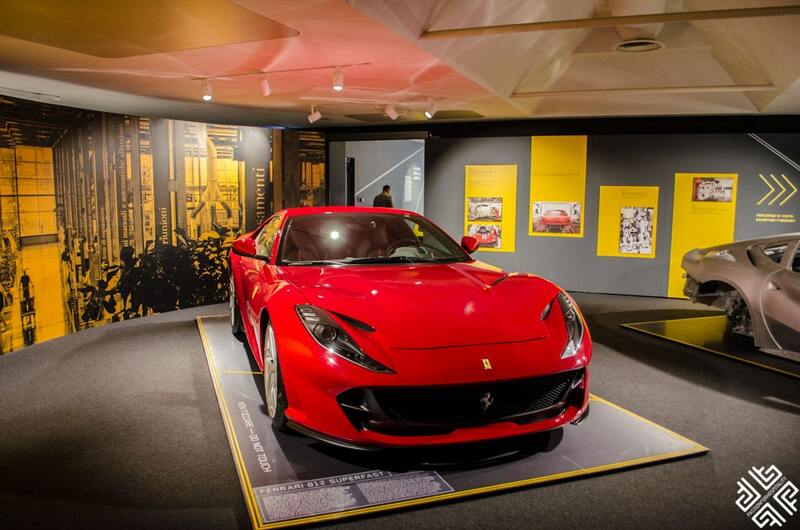 You can opt for more and also have a 360 degrees taken of your driving a Ferrari experience which you can take back as a souvenir. 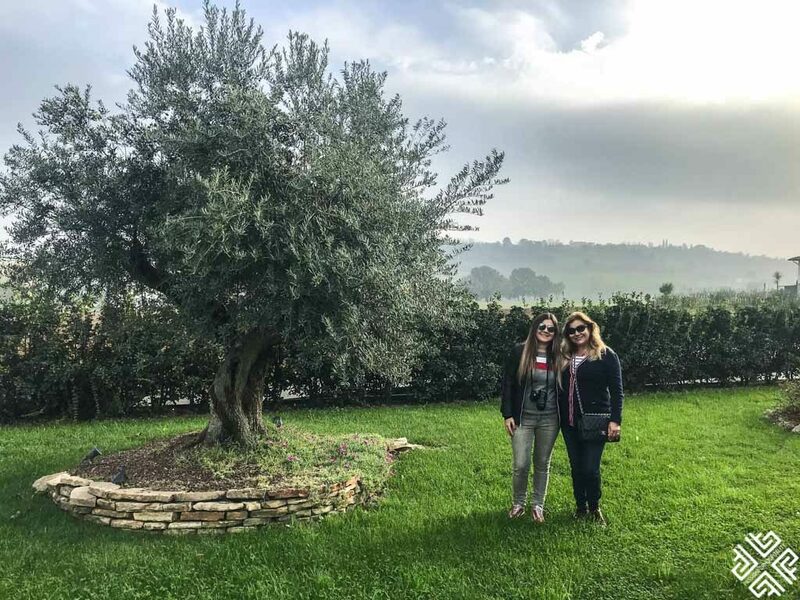 In the afternoon we concluded our Food and Ferrari driving experience at a traditional restaurant set outside of Bologna, overlooking the gentle rolling hills of the Italian countryside. 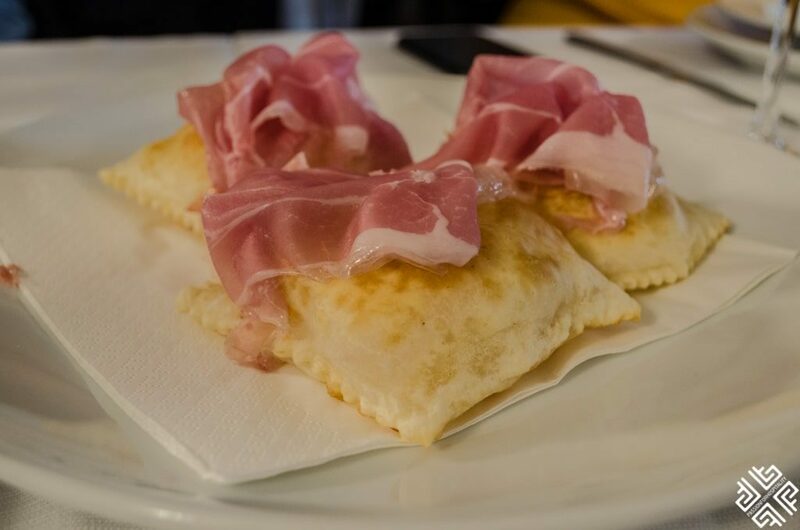 Famed for its homemade pasta we had a delightful 6 course Italian lunch which started with the Gnocco fritto a staple dish of Emilia Romagna region which is a light, crisp pastry served with Prosciutto di Parma. 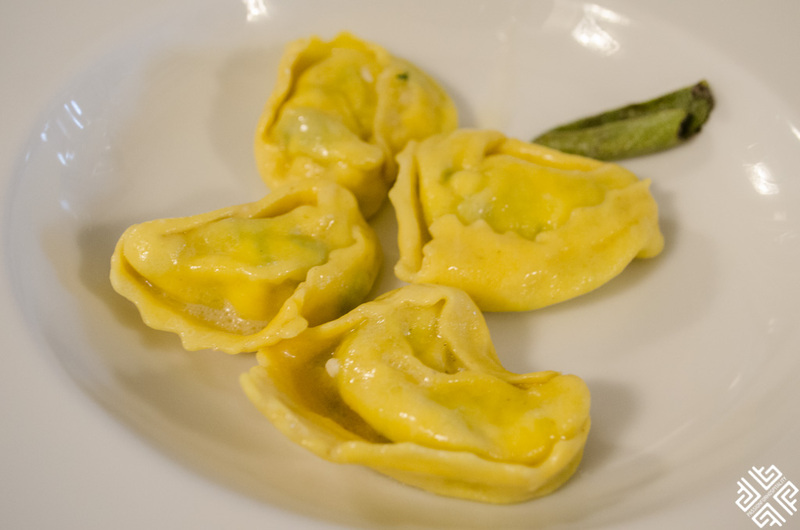 We then tried the three different pasta types: Tortelloni stuffed with ricotta cheese and spinach, Tortellini which is the famous dish of Bologna commonly known as the navel button of Venus stuffed with mortadella and cheese and Tagliatelle ragu, which is the Bologna version of Spaghetti Bolognese. For main course we had tender beef fillet medium cooked, served with roasted potatoes and grilled vegetables. The excellent meal was topped off with dessert — a lemon sorbet and Mascarpone cream with chocolate flakes. The meal experience was paired with a choice of red or white wine. 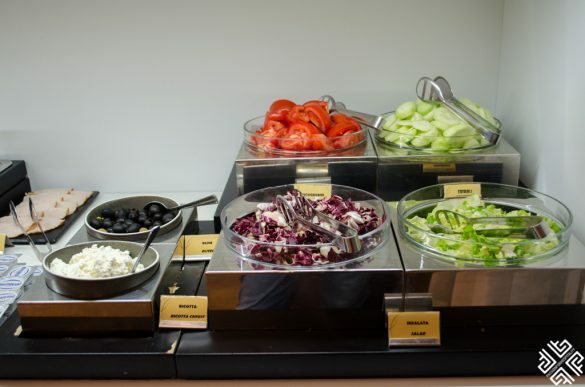 This tour offers a fantastic combination of food and luxury cars. An ultimate experience that I highly recommend to anyone who wishes to get an insiders introduction to the best of Emilia Romagna’s region. 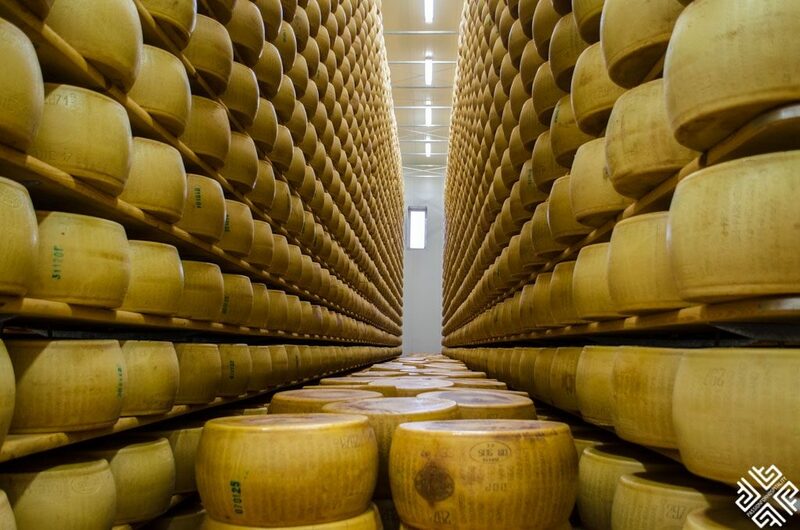 If you are passionate about food you will greatly enjoy learning about the process of making some of the world’s most famous foods such as Parmigiano-Reggiano, Prosciutto di Modena and Balsamic Vinegar of Modena. 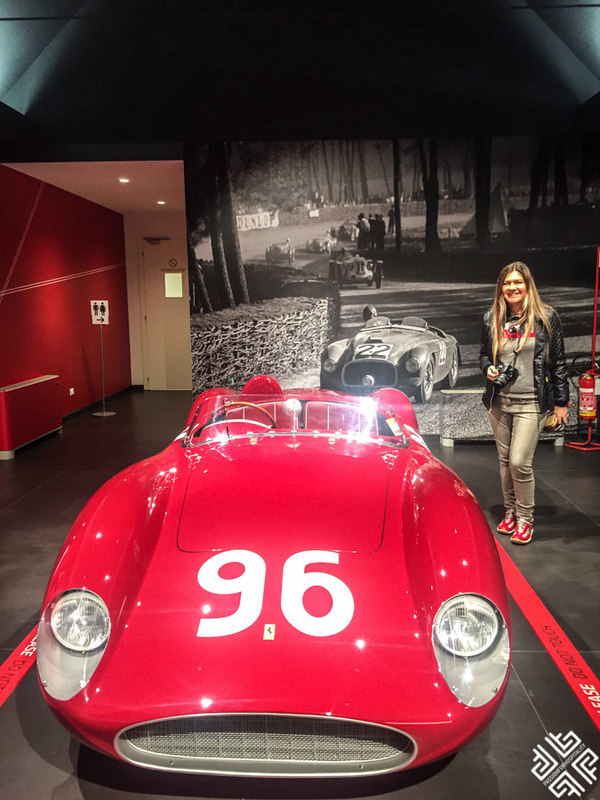 The highlight of course is the visit to the Ferrari Museum Bologna and an opportunity to test drive a Ferrari. Andrea and all the producers whom we met managed to convey their passion for their homeland. This is also a fantastic day trip opportunity for the whole family. You can also join this tour even if you are not staying in Bologna. Some of the tour participants had taken a morning train from Venice in order to join this Food and Ferrari Tour. Includes: transportation from and to central hotels in Bologna and Bologna train station, entrance ticket to Ferrari Museum, 6-course lunch with wine, bottled water on the bus and a gift. 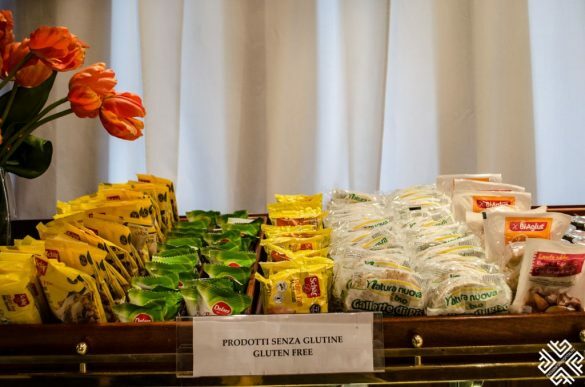 Where to Stay in Bologna? 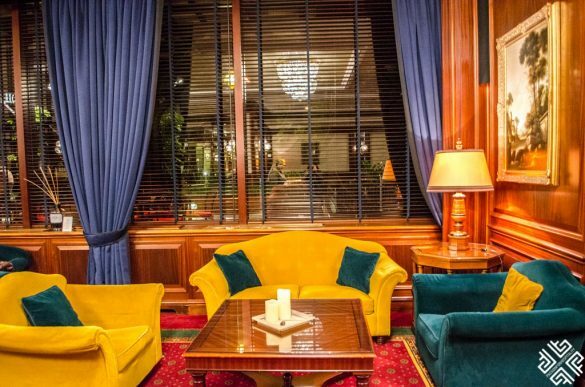 If you are looking to stay close to the heart of the historical city centre of Bologna, then these two properties are a perfect choice for your Italian getaway. 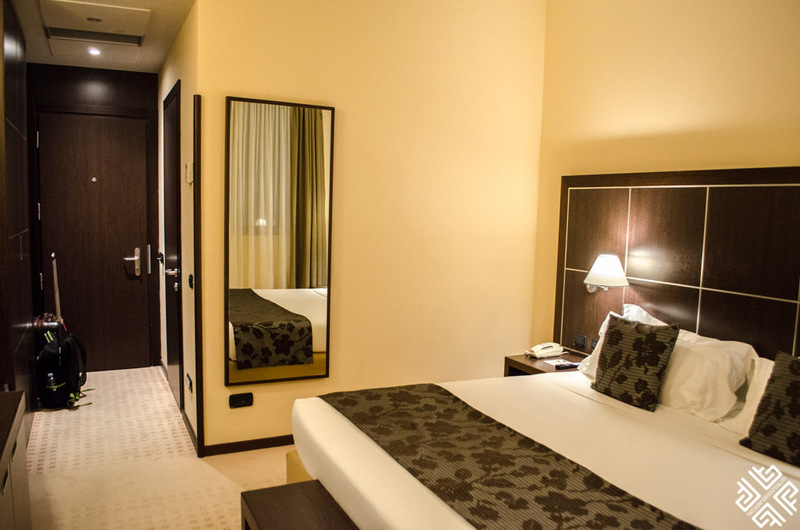 This modern 4-star hotel is located approximately a 15-20 minute leisurely walk from the heart of Bologna (Piazza Maggiore). 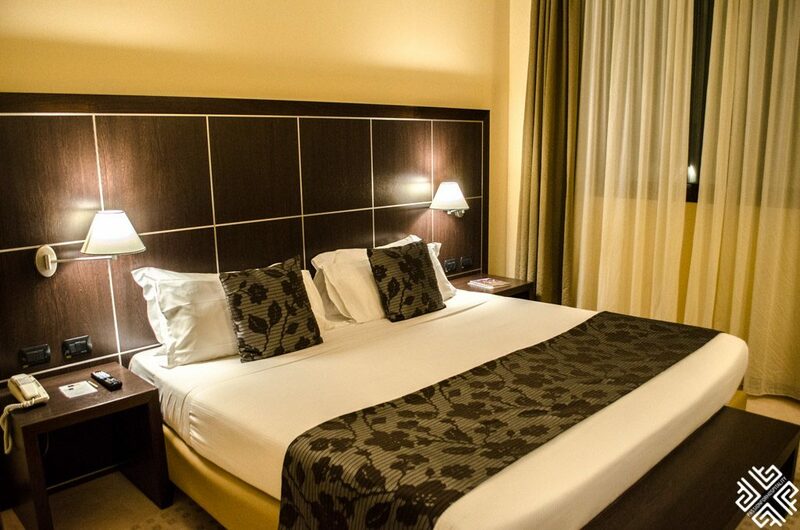 Aemilia Hotel spans across 6 floors and features 124 guest rooms. 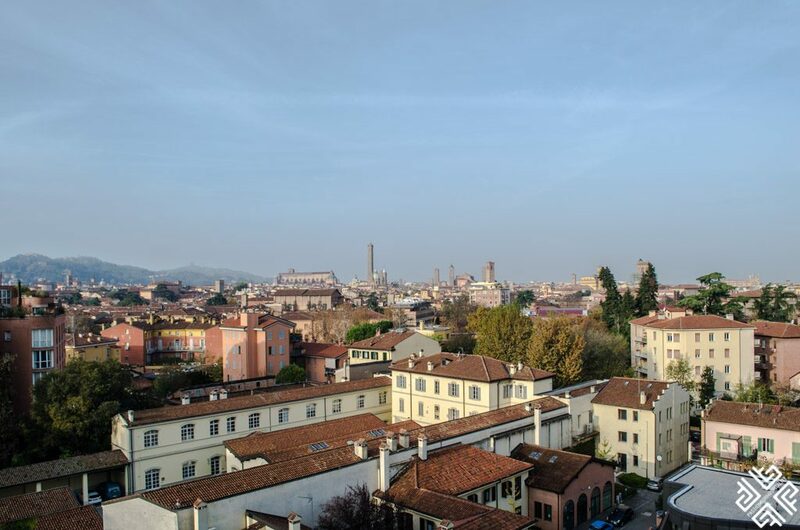 The rooftop which operates during the summer months opens up to spectacular views of the historical city of Bologna, the two towers and its surrounding hills. During the warmer days of summer you can enjoy a relaxing afternoon in the Jacuzzi bathtub or simply savour a delicious cocktail on the outdoor terrace located on the first floor. Our guest room featured a comfortable king size bed and a working desk, a flat-screen LED LCD TV, minibar and electronic safe. 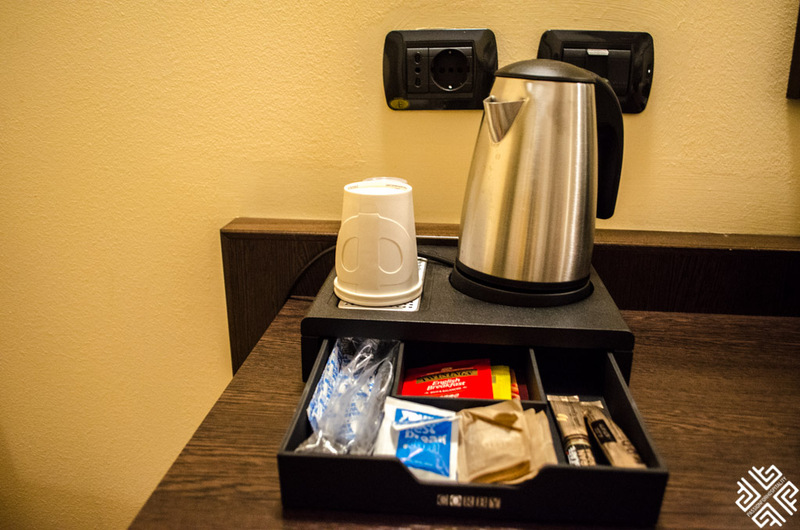 The room was also equipped with tea and coffee making facilities. The bathroom features a large walk in shower, some guest rooms come with a bathtub. 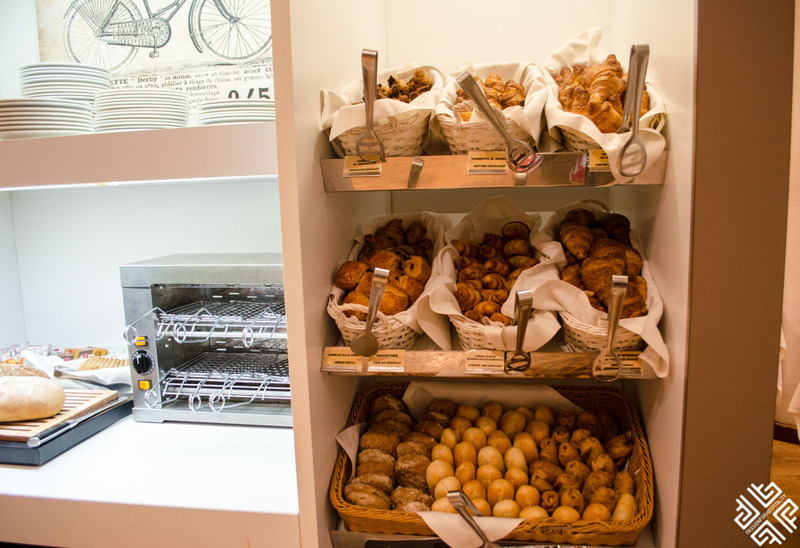 Breakfast is served in a modern and spacious dining room on the first floor. 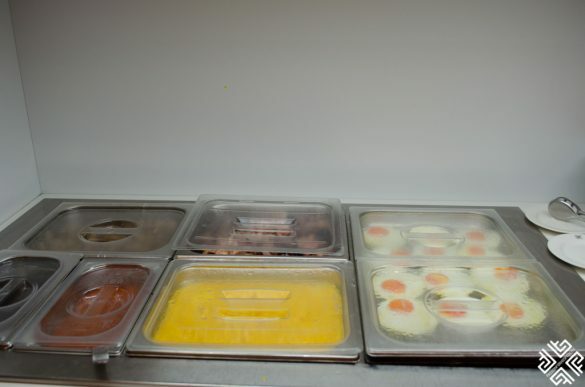 There is a selection of cold cuts and cheeses, hot dishes, eggs, cereals and freshly baked goods. The Aemilia hotel is located in a quiet area and features conference facilities and parking for 500 cars. There is also a fitness room available to all the guests of the hotel free of charge. 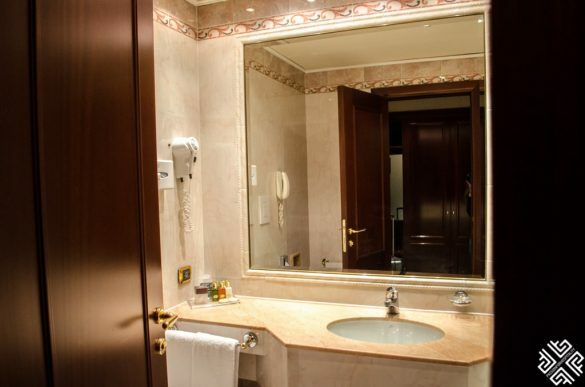 The airport is located at approximately 13 kilometres from the hotel and 2 kilometres from the Central Railway Station. 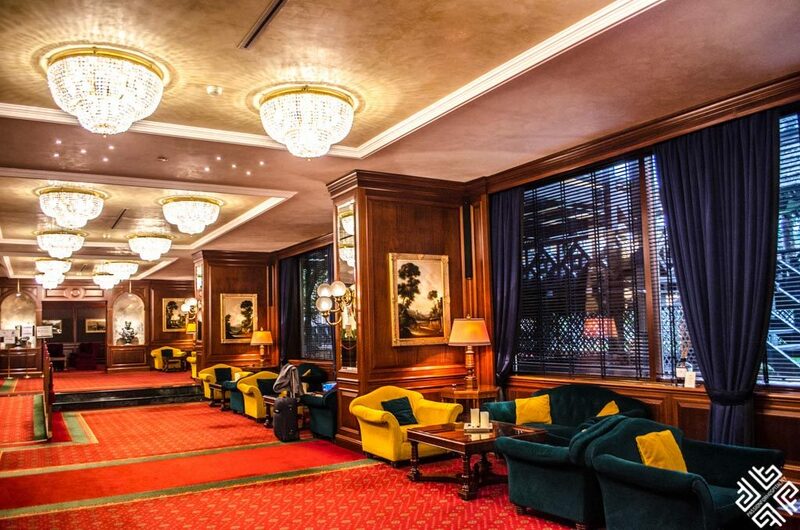 Member of the Monrif Hotels with four star properties in Bologna and Milano, the Royal Hotel Carlton is a city resort completed in a neoclassical style. 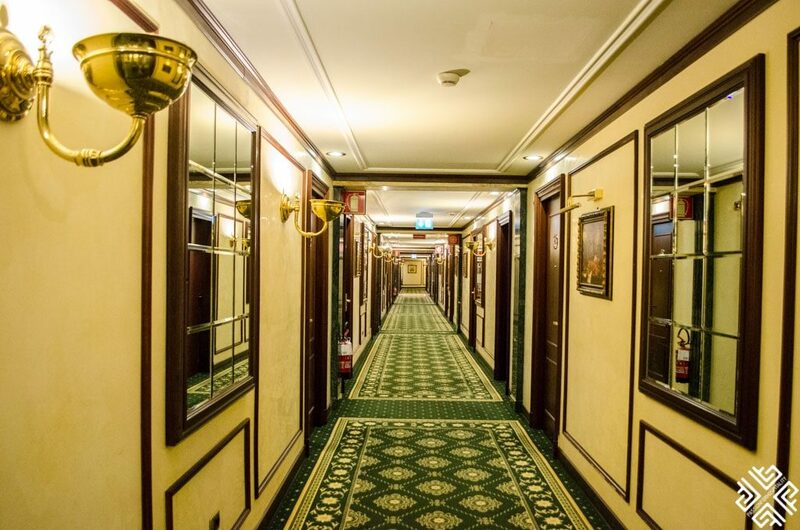 Housed in a 70s building which was completed by the famous architect Enzo Zacchiroli, who was also commissioned prestigious architectural works such as the Johns Hopkins University and Malpighi Hospital, the Royal Hotel Carlton features 236 guest rooms. 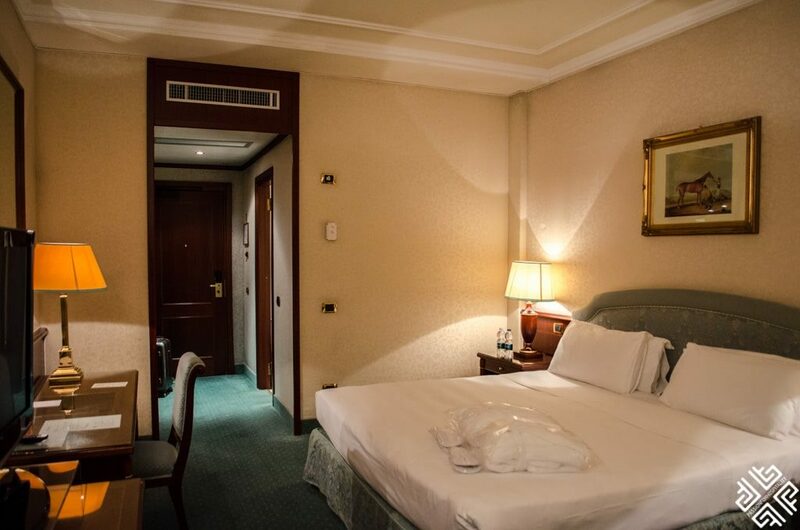 Our spacious Deluxe room was equipped with all the modern amenities, a separate sitting corner, working desk and king size bed. 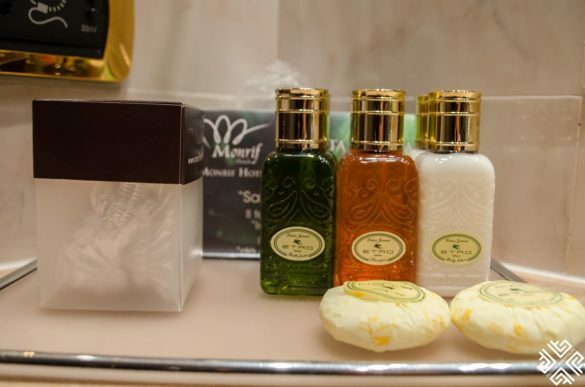 The marble bathroom features a bathtub and is stocked with Etro toiletries, bathrobes and slippers. Wi-Fi is complimentary. The hotel features a Spa by Clarins, a modern fitness centre with Technogym facilities as well as a conference centre. 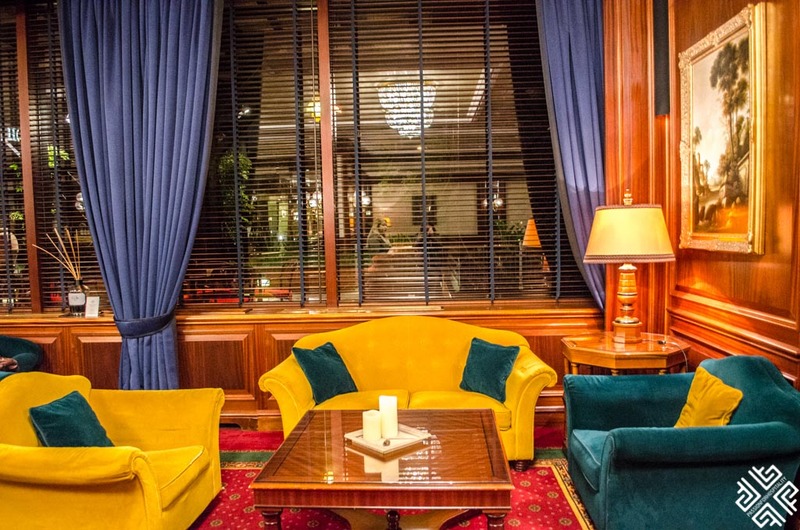 The hotel decor is completed with plush furnishings, carpeting and beautiful chandeliers. 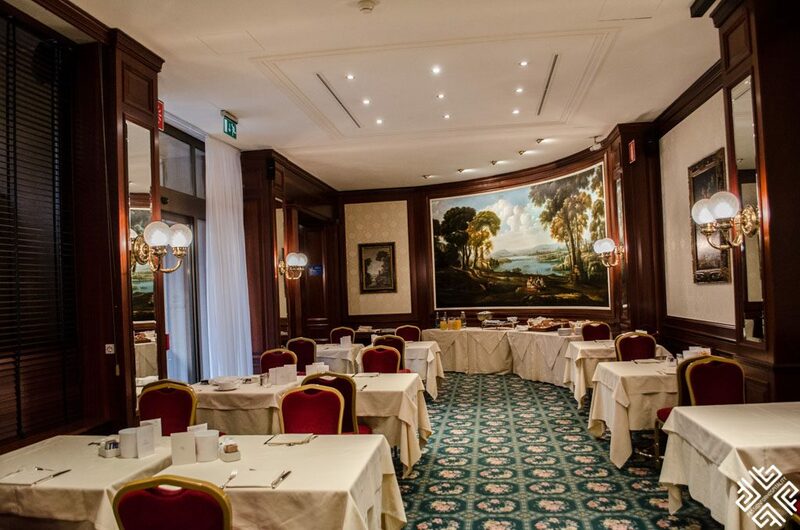 Dining options include a Neoclassical Restaurant and Bar. Breakfast is served in a spacious dining room and offers a fantastic selection of cereals, baked goods, cold cuts and cheeses, salmon, hot dishes and a generous choice of gluten free items. It is located at a short walking distance (approximately 10 minutes) from the famous Piazza Maggiore and 5 kilometres from the G. Marconi airport (The price of a taxi from the airport is approximately 20 Euro). There is also parking at the hotel in case you are renting a car.